As usual with these kinds of errors, a good starting point is to locate the actual game folder. From Steam’s Game library, right click on “Kane and Lynch: Dead Men” and select properties, then select the tab called “Local files” and finally click the button labeled “Browse local files”. You’ll now find yourself in the game directory. By trying to execute “kaneandlynch.exe” you’ll get an error message stating that “xlive.dll is missing from your computer”. Thankfully, Steam has already included the necessary libraries inside a folder named XLiveRedist which contains the installer package XLiveRedist01.02.0241.00.msi. So why the need for xlive.dll? 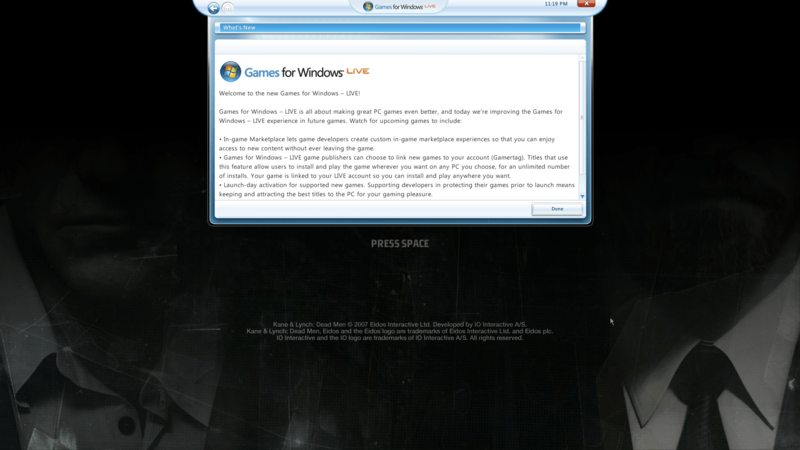 The file itself stems from the Games for Windows Live platform, on which Kane & Lynch: Dead Men was released back in 2007. For those interested this Wikipedia article might be worth a read. This bundle will also install “Games for Windows Marketplace” but just get rid of it (as in uninstall from “Programs and Features”) after the installation has completed. Never install xlive.dll from any source other than Steam or Microsoft.